"A huge arm and shoulder, with a dark green skin of greenish scales, was thrust through the widening gap." Dress– For Galadriel I started with a Style pattern 1204 view 1. It was a size 8 pattern but had to have a lot of adjusting done; the skirt part gave way too much space so I had to leave an entire section of it out. I had almost no money to spend so I made the dress part itself out of a plain white sheet. Then I went to the Salvation Army store and bought a pair of old lacy curtains to use for the sleeves. You probably wouldn’t need a pattern for this dress, but it was my first attempt at sewing anything more complicated than a T-shirt. When I finished sewing the dress and tried it on, I thought it looked a little too bland. It needed something to make it prettier, so I went to a craft store and bought a small bottle of glitter glue. I used that to put the stars on the front. Cloak– This dress wasn’t originally going to have a cloak, but I thought it helped hide some of the errors I had made. The cloak was also made out a sheet but a more heavy duty one than the dress. For the hood I just traced a hood from a jacket I already had. The rest of the cloak I made up as I went along by holding the material up against me and tracing a somewhat cloaklike pattern onto it. Then I added the stars to make them coordinate more. Headpiece– My headpiece looks absolutely nothing like the real thing, I’m sure. However, I could never find a proper picture of it and I don’t really know how to describe it very well. What I did that I thought looked very pretty at the end was I bought some 20-gauge wire (cheaper if you buy it as rose wire as opposed to craft wire), twisted the wires together to give it a swirl effect, then wrapped them around my head in a random pattern. Then I hot glued fake gold and silver leaves to the wire. Hair– I bought a straight blond wig and curled it (I don’t own a waver).Then I did the hairdo like photos I had seen of her. Shoes– For shoes I bought some very high $5 white sandals (at Wal-Mart) with laces that wrap around my ankles. I liked them because they made me taller. Ears– I bought some pointed ears at my London Drugs called “Fantasy Ears”. They looked fairly realistic after being covered in flesh colour make-up. Outfit– Once again my brother waited until the last moment to look for a costume, so 3 days before Halloween he asked me to make him a Frodo costume. Because of the time problem, this is not a very accurate costume but it gives the general idea. He wore a plain white shirt that we borrowed from our dad and some old pants that we simply cut to the right length. For the vest I took the zipper off an old vest and added buttons. Cloak– For this cloak I bought some plain brown fabric at Wal-Mart (I couldn’t find any of the right colour green that wasn’t really expensive). I just traced my Galadriel cloak onto it. I used an idea recomended by someone else to this site. I cut out a photo of an Elven brooch that I had printed off from my computer and glued it to a pin. The One Ring– Being a huge LotR fan, I have lots of One Rings lying around so I just lent him one from a book-mark and a chain. Hair– I bought a black Afro wig (strange, I know) and just cut it very short. Shoes– Luckily for me, my brother has HUGE feet that already look the right size. So I simply hot-glued some of the hair from the wig to some of his sandals. Ears– Here is where a problem arose–as well as big feet, my brother also has big ears. The ears I bought for myself were too small for my brother. I finally found some bigger ones, called “Elf ears”, at a store called San Fransisco. Dress– After seeing my dress, my best friend insisted I make her an Arwen one. We looked on the Internet for some of Arwen’s dresses. All of them are very complex, so I chose one commonly known as the “Blue Lace Dress” and did a very simple version of it. The end result was fairly pretty. The material was a shimmery dark blue that I got at the Wal-Mart (They have a fairly good selection of material). For this dress I combined a simple skirt pattern with a T-shirt pattern, and simply added the sleeves on the spot. In the movie there was sort of a green design around the collar. I didn’t know exactly what the pattern was, so I improvised. Taking a simple three-leaf pattern, I cut the leaves out in different sizes from the leftover green meant for the cloak. I then glued the leaves to the collar with fabric glue and surrounded them with the same glitter glue that I used for stars on the Galadriel costume. After that, I cut a long strip of green material to tie around her waist as a belt. Cloak– This cloak was made of some cheap green material from our Wal-Mart. 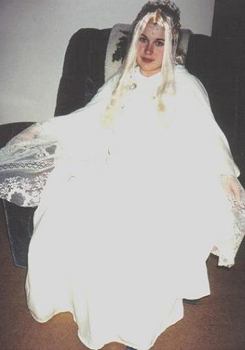 I made it the same was as the one for the Galadriel costume (without the stars). Mostly I just held the material up to her, cut it to shape, then hemmed it afterwards. Evenstar– Again because of my extremely low budget, I was forced to make this instead of purchasing it. It was made out of the same flexible wire and silver leaves as the Galadriel headpiece. The stones were taken out of some earrings that I bought for a dollar a pair. I just hot-glued it all together and attached it to an old jewellery chain and clasp. Hair– I bought a straight black wig, wet it, braided it, then unbraided it when it was dry. Shoes– She used some high black sandals that I had already owned, making her taller and look more Elf-like. Ears– I used some “Fantasy Ears” I bought at my London Drugs. They looked fairly realistic after being covered in flesh colour make-up.